Heathrow has been phoning the Mustard Seed for advice. 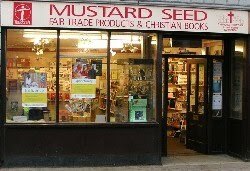 How DOES the Mustard Seed manage to stay open - simply through the valiant efforts of stalwart septuagenarians - without even having access to the 47 Heathrow snoughploughs? Is it all about giving our loyal customers the perfect little shop for all those perfect presents - right up to lunchtime Christmas Eve? THANK YOU for your continuing support - and a Blessed & Peaceful Christmas to you & family.